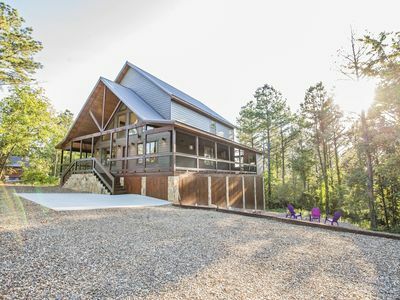 Nestled high up on a hill, no place is cozier than 'Dancing Bear Lodge,' a 2-bedroom, 2-bathroom vacation rental in Broken Bow. 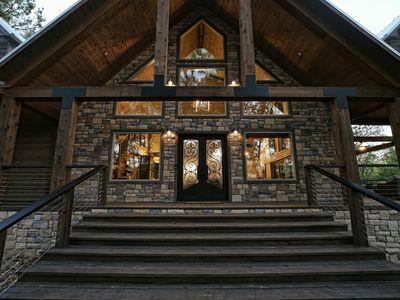 With a 1,200-square-foot wraparound deck, fire pit, and breathtaking interior, it's no surprise this luxury cabin was featured on the cover of Oklahoma Today magazine. 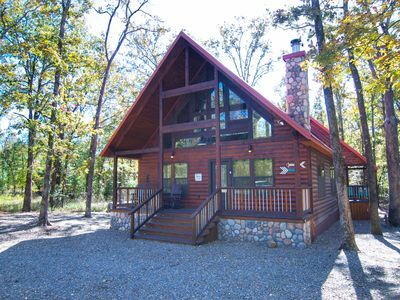 When you’re not lounging at the lodge, drive just 1 mile to water activities at Broken Bow Lake! 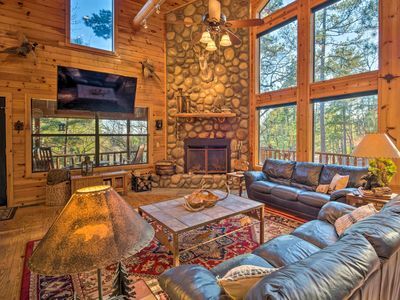 With floor-to-ceiling windows, natural views, and soaring ceilings, 'Dancing Bear Lodge' offers the perfect combination of warmth and luxury. After a day of traveling, drop your bags and luxuriate on the 1,200-square-foot wraparound deck. 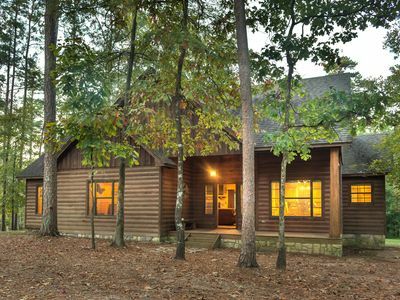 As you lounge in a rocking chair and listen to the birds, you'll be surrounded by tall native hardwoods and swaying pines. 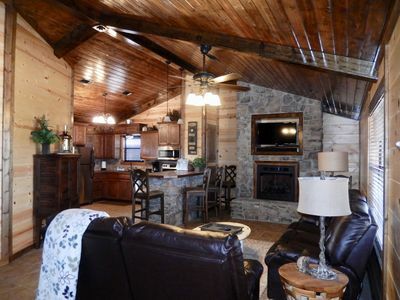 Whether you're curling up by the 2-story wood-burning fireplace, watching the great room's flat-screen 4K HDR TV, or relaxing with a good book in the upstairs loft, this vacation rental is the perfect place to unwind after a day at the lake. The fully equipped kitchen, located steps from the living area, has everything you'll need to whip up a memorable feast including expansive granite countertops and stainless steel appliances. 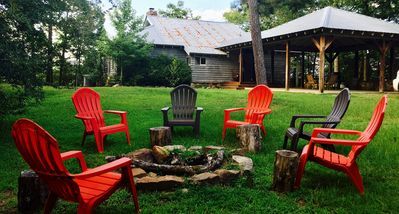 Once you've finished feasting at the dining table for 6, head outside and gather around the fire pit. 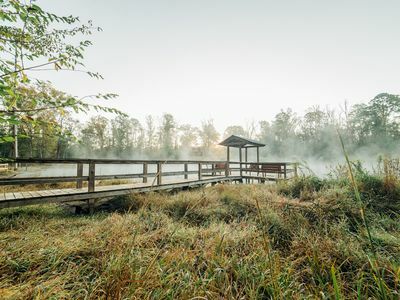 Whether you choose to roast marshmallows or simply enjoy your quiet natural surroundings, you'll feel far from city stresses as you listen to the flames crackle. 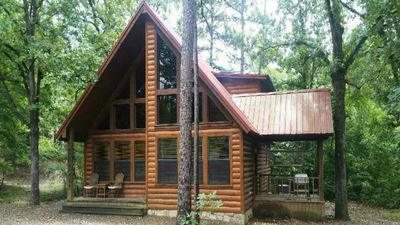 Both of the cabin's bedrooms offer flat-screen 4K HDR TVs, outdoor access, and en-suite bathrooms. 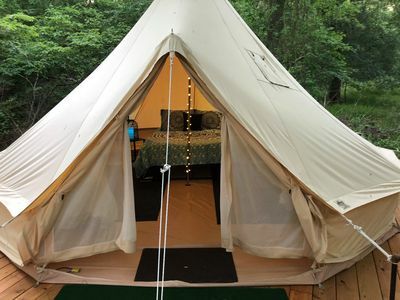 You're sure to emerge from your queen bed well-rested and ready for adventure. 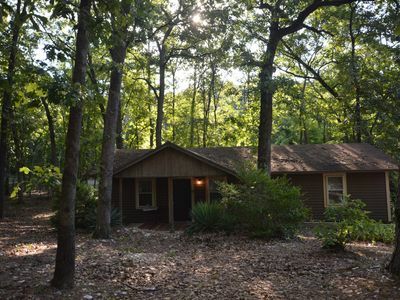 Just a stone's throw from Beaver's Bend State Park's hiking trails and 5 minutes from restaurants and local attractions, 'Dancing Bear Lodge's' location can't be beat! 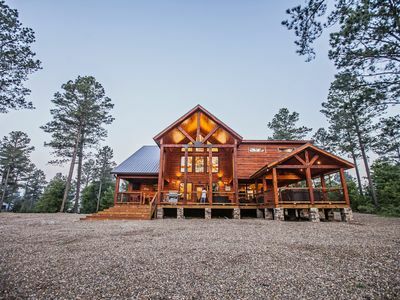 Be sure to spend some time at Broken Bow Lake during your stay. 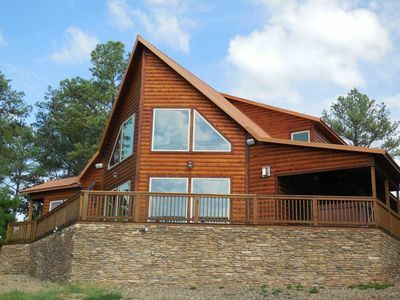 Sitting 1 mile down the road, this sprawling lake offers boating, swimming, water sports, and more. 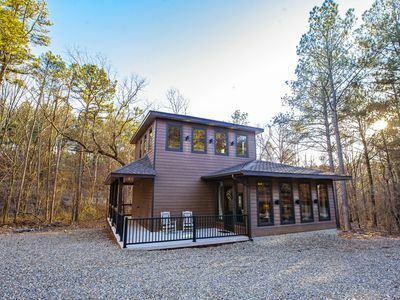 For even more outdoor fun, head 10 minutes away to Mountain Fork River. With a constant flow of cool water, this pristine river is home to top-notch trout and fly-fishing. 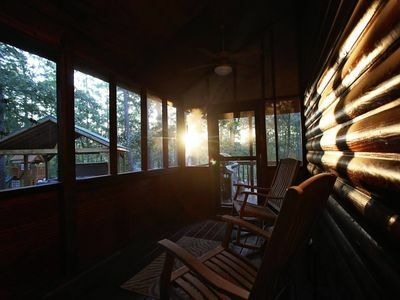 You'll also be a short drive from golf, wineries, and unbeatable local fare. 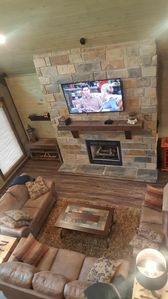 - Amenities include a fully equipped kitchen, 3 flat-screen 4K HDR TVs, a 1,200-square-foot wraparound deck, a fire pit, gas grill, free WiFi, in-unit laundry machines, a wood-burning fireplace, floor-to-ceiling windows, a furnished loft, ample parking, and more! SPRING SPECIAL!! 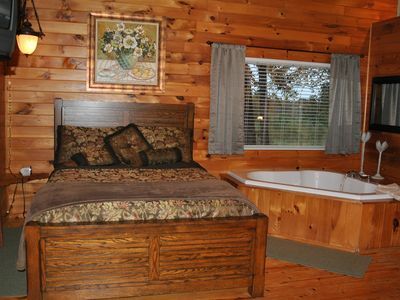 Boomer Bed & Bass; 2 bedroom, 2 bathroom family cabin. 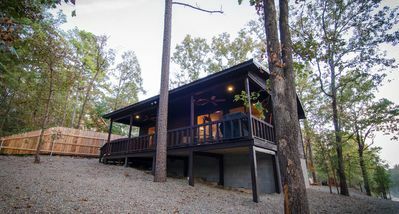 Escape away to Walnut Hill Hideaway. 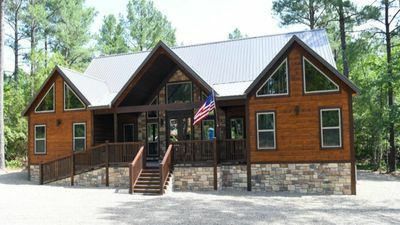 Your perfect family friendly retreat! 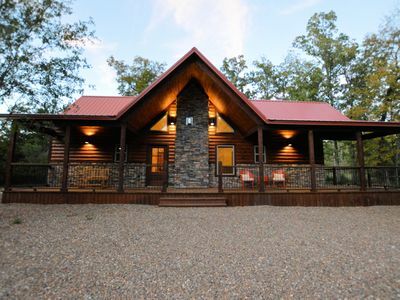 Sneak away to this hidden oasis at the foothills of the Kiamichi Mountains. 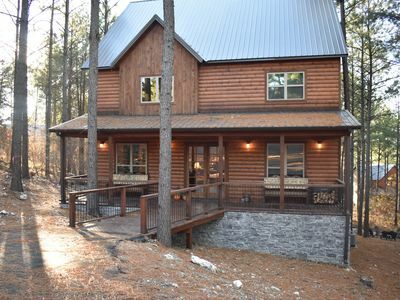 The Wolf Cabin at Cedar Valley is your destination to get away from it all.